If you are experiencing lag download Optifine for 1.7.10 and put it in the mods folder. Can you survive a night with horrors, build a base that will be admired and defeat your nightmares. Can you defeat the biggest and most feared mob in the Kinda CrazyCraft? The King, The Queen or the Kraken, and even explore The Twilight Forest! This modpack offers you lots of different genre of mods, There are Technical mods, Farming mods, Magical mods, Building mods, and different mobs. This allows you to build an amazing house, build a huge factory and fight your worst enemies. This modpack makes adventuring and exploring a lot more exciting with different dimensions and mobs. There are currently 149 Mods to enhance your experience Including Mekanism, Buildcraft, Applied Energetics, Orespawn, Industrial craft, The Twilight Forest and a lot more. In this modpack you have some of the mods from crazy craft and a couple I added in myself. This is not a quest pack so it is sandbox you can build whatever you want and you can make a server with your friends and play together. Kinda CrazyCraft Partnered with BisectHosting! These servers are ready configured so you don't need to know anything about servers. If you buy a server with my link and use my code 'KCC' you will get 25% off your first month. This modpack is recommended to have at least 2GB to run smoothly. where do i put the mod pack? Hello I'm just wondering when I'm in my game I have the items, but I don't have the custom buildings,Custom ores ect. But Sometimes I have the items AND the secongd thing is my game keeps crashing when I kill something on my server. Hey so my friend made a from scratch Minecraft server and we were able to run crazy craft from voids wrath great because it had a server pack download. 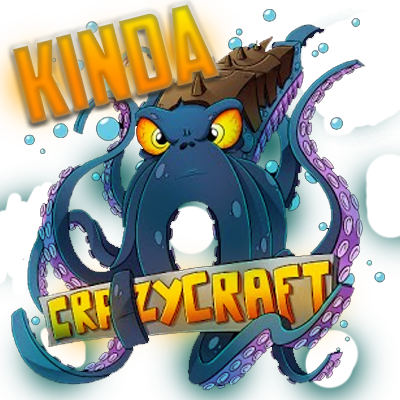 Is the 1.12.2 version of kinda crazy craft have a server pack also? I know it says server pack but is it meant for from scratch servers like the one on voids wrath? currently not, I will update you when I have fixed it! Alternatively, you can buy a cheap server using BisectHosting Use code KCC for 25% off your first month! Is there a way i can delete termites? not the mod, just the termites? No not from my knowledge, sorry. How long has this been going on. Is it since the new update? Also make a post on the forum because I have never known this issue. Sorry for you problems with the modpack. This is a recent occurrence (as of the last week) I try to load it several times, I have had no issues in the past but now it seems very difficult to find the issue or root cause... and I can't find the forum? perhaps a link? I love this mod, BUT I too am having a ton of trouble with lag. Not sure if its from Morph or from going into the other realms (typically happens after clicking on a brown or red ant, but not immediately). The strange thing is, the lag appears to affect all of my saved worlds. So I can log out of the main one that starts having issues, open a new world, and I still get the same lag. Then if I close and re-launch Kinda Crazy, I still have the same issue. However, If I close and re-launch a different modback, like Fool Craft, I don't have issues. I am on a Macbook Pro running Mojave, so it might have to do with java, but that doesn't explain why some other mods run perfectly fine. I have 12GB ram allocated. The Lag is kinda crazy. all mobs seem to freeze in place. If I break a block, it unbreaks, then breaks again minutes later. Sometimes I get stuck in the same location, running a few steps then I am back where I Was a few seconds ago. It's pretty frustrating. Is this on a server or a single-player world? If it is multiplayer it is a problem with the allocated ram to the server or CPU usage. It it is single-player it could again be the CPU. Also the ant dimension is very laggy if your computer is a little slow, Macbook Pro's (although being good computers) aren't usually made for Minecraft so you may end up with lag. I am very sorry you are experiencing problems with my modpack but from what you have told me it is most likely to be fixed in your video settings. If that doesn't work you could try clearing your Temp file and Prefetch file (if you don't know how to you should be able to find a video showing you) and also do a virus check. Again very sorry for your inconvenience, I hope this can fix it. If you want to talk to me in a dm please do.